I met Natalie Kardum at a coffee shop on Hastings St back in 2012 just after the wrap up of the 2012 Vancouver Short Film Festival. One of the most charming and personable people I have ever met, she liked the looks of me from that first meeting enough to give me my first internship. I started with VSFF2013 as the social media coordinator while she was festival director and I grew in that position for 2 years and could never be more thankful for the opportunity she created for me. Both still involved in the festival circuit in Vancouver, I decided to catch up with Natalie post-flu season and see how she has progressed, thrived and stumbled whilst navigating her career through the Vancouver film industry since the three years we’ve known each other. Paige Godfrey: Natalie, thank you again for taking the time to chat with me! To start off I’d just like to get a bit of a background on you and the influences that directed you to study art and develop it into a viable career path. Natalie Kardum: Sure I’ll start way back, when I was a kid I was heavily into dance and I joined a youth dance company and performed and took classes. From there I had an interest in theatre and acting so I was doing that and started to develop a real love for film. And not just Hollywood blockbuster film but I was really into art house films and foreign films and I had an obsession with all things French. I got into a theatre arts program at Langara College at Studio 58, one of the top acting programs in Canada and while I was doing that I knew that I wasn’t going to be an actor. So after that I completed my BA in History at UBC and for a year and a half I worked as a research assistant researching clearances for images, documentary films and music. Then I moved to the UK and I did the work-travel visa. I ended up moving to London. It is a really culturally diverse city and so when I decided that I wanted to do a master’s degree I found a program at Goldsmiths College of London. And my master’s is in Arts Administration and Cultural Policy. Goldsmiths College had some of the foremost artists like Damien Hirst and Vivienne Westwood, so it had a really art school vibe. And I enjoyed studying cultural policy in the European Union sense as what I found doing a lot of volunteer work in arts in Vancouver, there are so many good ideas and lots of stuff happening but some arts organizations lack that business acumen behind it. You have a big idea but the delivery can be a bit off. So I wanted to do a program that focused on business plans and the administrative aspects. I’m working for a non profit right now and I’ve finished doing a certificate in project management. I’m just trying to find a balance between working and arts and non profit from a business and organizational side. Arts can be very touchy-feely and there’s a balance because you ultimately are running a business and if that’s not part of your whole big picture, you see stuff that doesn’t work, like the operational side doesn’t work and a lot of time and money is wasted. PG: So after your master’s degree you came back to Vancouver, did you know exactly what you wanted to pursue? NK: Yes and no, Vancouver is a lot smaller and thought there is a vibrant arts community here it’s on a different scale. I think arts in Europe, and I’m not speaking for everybody but I think arts are really a part of people’s values. Here if the government wants to cut money they cut arts and culture first but they don’t realize that the importance behind arts and I think other countries in Europe have a better grasp of that. So when I came back here it was hard to know what to expect. I ultimately wanted to work in film festivals or some kind of non profit but Vancouver is tough because you’ve got one big festival which is VIFF and that’s the festival where they pay you but it’s just one festival. PG: Locally, is it financial obstacles which festivals here face trying to build themselves into the festivals you’ve seen in the UK and the rest of Europe? NK: I think so; I mean festivals are really expensive. The festival’s I’ve worked most closely with are non profits like the Vancouver Short Film Festival, the Vancouver Web Festival and now I will be doing some programming for the Vancouver Asian Film Festival. They are great festivals but its all volunteer based. I think that the festivals that have run for a long time, I don’t know if it’s in their long term goals to have paying positions. So I think it is money but also I think it’s the board or the people running the festival; it has to come down in the whole operational aspect. Once you start trying to get the money to have a part time staff, it’s a lot of work to be able to do that and deal with all sorts of things like taxes and unemployment. I think at one point if you are really seriously into it and want to make it your full time paid job it is a lot of transition and I think some people kind of step away from that because there’s a whole ton of responsibilities connected to that. PG: Conventional ideas of an artist would be a practitioner of a certain craft; like painting, dance, sculpting, etc. As a programmer and festival director and coordinator would you also consider yourself as a practicing artist? NK: The first thing that comes to my mind is no but when I think about it, I mean, I don’t want to say you are orchestrating something when you are programming but you are putting together a series of moving art. I’ve had more experience programming short films; I think you do have to have an eye for it or a talent. Every festival has a different process in how they select their films and the part I find the most difficult is putting the program together. Particularly a program with short films. When I try and do that I think of it in a sense of telling a story, like a beginning, a middle and an end. As programmer you are a part of the story telling. I think about which is the best short to start with and it has to kind of have flow to it and it has to end with a bang. So I think in order to keep the audience engaged there is an art to putting a program together. I don’t know if I consider myself an artist because of that but it’s like you are a curator who definitely appreciates the work and knows how to display it in a way so it tells a story, so it looks the best way it could possibly look. VSFF. Festival Postercard, 2013. Courtesy of Saba Taghvai-Arabi. 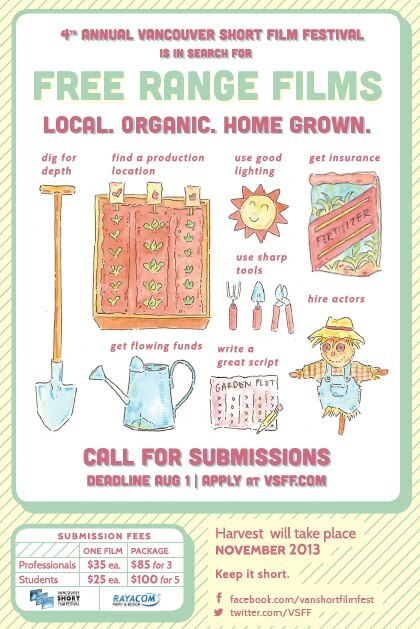 PG: When you were the Festival Director for VSFF2013 were you at all a part of the programming or was that responsibility in the hands of the programmers specifically? NK: In terms of my involvement in curating or programming, I worked with the Programming Direct and we went through the highest rated films and made the decision of what should be screened. It’s then a matter of what will work in the program, how will they work together? It had to flow. The programming part is hard because sometimes there are a lot of great films and you want to show everything but it’s a matter of which work best together and what is going to make the strongest program. PG: Would you consider programming as the biggest challenge as Festival Director? NK: There are so many different variables. You are overseeing so many different things. Let’s say for sponsorship, if they don’t hit their targets at the end of the day I have to report that to the board. Also when you are working with volunteers, they are volunteers and sometimes stuff comes up and other jobs come up. So there’s only so much pressure you can put on people because ultimately they are not your employees. So sometimes that can be stressful and towards the end when you have to get a program up by certain date to sell tickets and everything needs to come together. But my favourite part is the programming and watching the highest rated films. PG: How important do you think the overall program is compared to the individual films in regards to the influence on the audiences’ engagement/attendance. NK: I think it could go either way to be honest. I mean if we show a film that already screened at other then sometimes that will bring in people. And sometimes I think it really depends, one year we had a couple of short films that had done well internationally so when we brought them to VSFF then there was a hike in audience attendance because those particular films were screening at the time. PG: Specifically with programming, there are certain themes that run through them. Are they something you search for or do they appear naturally from the films? NK: It happens organically, I don’t worry too much about it. With the Program Coordinator we put the films together in their actual programs then we kind of looked at it and see what works as each program couldn’t be more than an hour long. So once I kind of did that and flipped a couple the themes really became apparent and that was much easier than I thought it was going to be and I think all the films that were programmed really lent themselves to the theme. PG: What would be your predictions for the future of festival programming and its reach and impact on the community? What would you like to see happen here in Vancouver? NK: I’d liked to seem more festivals. I think people here generally come out and see them and support them which is great. I’d like to see the festivals that are currently running continue to grow and grow an audience base. I think sometimes it’s hard to get sponsorship and with companies that give products in-kind and not actual cash. What I would like to see is festivals tapping into people and resources that can get them that money. A lot of festivals try to get money from the same people and we can’t ask the 20 same companies to support every film festival in the city. So I would like to see a real initiative in finding other streams of money to help support the festivals and help with operational cost so that way the festivals can grow and hire people. Once you start paying people then levels of commitment will obviously change. I’d love to see more imagination and risk on the development and sponsorship sides and not thinking of sponsorship on a yearly basis but try to build it five or ten year at a time so support is almost guaranteed every year. PG: So you are currently with the local company Arts Umbrella but do you have any different goals for the future? You are interest in being a full time programmer, what challenges do you face with that here in Vancouver? NK: I’m starting with VAFF as Program Coordinator but hopefully programming one of their short programs. I’m programming again for VSFF. And this past year I’ve programmed for VWF and I would love to continue with them if I’m invited back. I’ve also just finished a certificate in Project Management so what I’ve been doing the past few years is go go go. I think I’m looking for a different pace of life where I have a bit more freedom with my time. This may sound a bit abstract but I’m still trying to figure out what that is. I want to have time to do contracts and work for festivals but also have a business with a stream of income and flexibility. I think I’m looking for a lifestyle change and how I want to live and fit the things I love doing into that and how that will work. So I guess I’m looking for something where I’m more my own boss. PG: But you still would want to be connected with arts locally? NK: I want to be creative and offer some sort of service or something to help people. What I’ve found these couple years, when you work in festivals you meet a lot of people and I’ve found that I have a lot of experience and younger people are asking for advice and guidance and I really like helping people. I’m just a really good cheerleader for people. I like supporting and encouraging people to achieve what they want to achieve and I think that’s how I work best. So I’m trying to find some way I can really help people and offer a service. In non profit it’s like social service because you are doing something to better the community. And arts do that. I’m more focused on serving people and help people and how to help them have better lives. PG: You are still finding your own way then? NK: I’m an arts administrator but I think in a way I’m like a professional learner. Have you ever read anything by Tim Ferriss? He wrote a book called “The Four Hour Work Week.” There’s so much in our lives that kind of bottlenecks what we want to be doing. I ask myself, how am I bottlenecking what I do and how can I get more impact in less hours. How do I delegate better and I think that people in the arts can really benefit from that entrepreneurial thought. Why I mention him is that he was saying that when people ask him what he does he says he is a professional learner. I am not going to be a somebody that is at the same job for twenty years because for me it’s pointless and totally boring and the moment I stop learning and evolving and trying to be a better person then I might as well shoot myself in the head. What I think is great about being that professional learner is that you are always open, open to how to make thing better. As artists, a person can’t paint the same tree for the rest of their life. They have to grow and evolve and paint lakes or oceans or cats and dogs. And that’s the way I look at it. Don’t get too caught up in having to have things figured out. Your job is to find what you love doing and have a plan but know that you can divert and don’t have to follow said plan. The arts, the arts are fabulous but it takes a while to get the job you want or do what you want to do.